I know, it’s late. Sometimes that’ll happen. Summer is hectic and my second job (third? 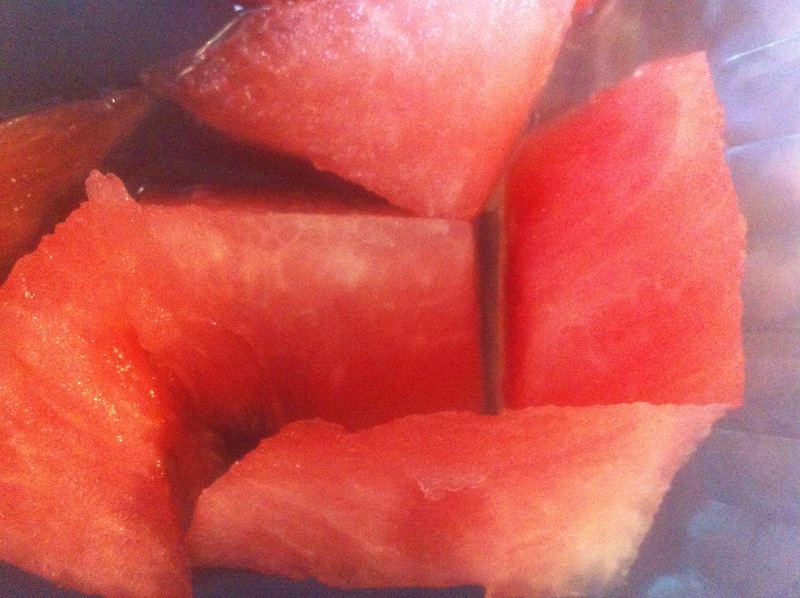 fourth?) requires I drive the next Cheepie generation all over town, and the city frowns on my writing posts while I drive. So for this week, a Thursday ad post. Corn is at 6/$1, so if you didn’t try some of these last time you’ve got another week to find your favorite. Boneless chicken is cheap, yogurts are 50c, bacon is under $3 a pound again and Fiesta’s got rice and pinto beans on sale. 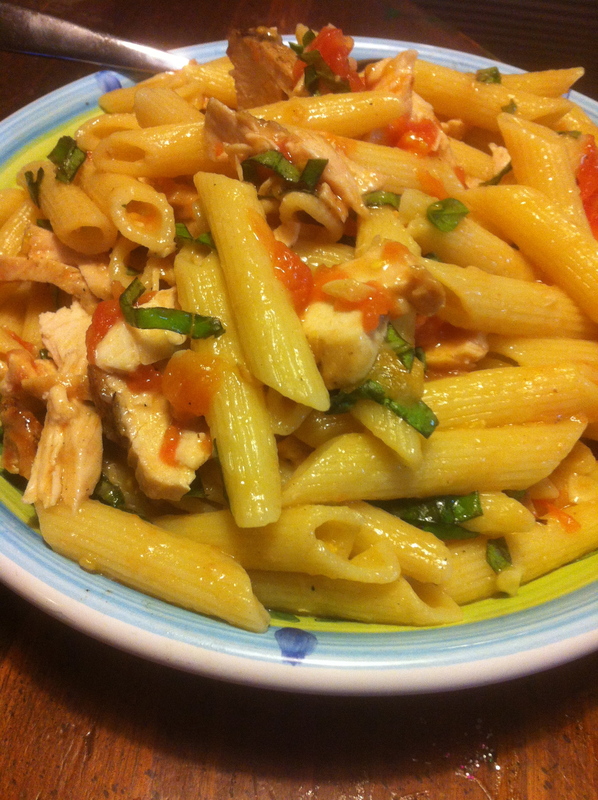 You can throw a lot of meals together on the cheap this week! Also, I don’t have any chicken legs/thighs listed, though they are 49c/lb at Fiesta, because we just had them on sale for 39c/lb there a week or two back. If you need chicken, you can go there. If you don’t want to deal with the 10lb sack, HEB has their $1/lb drumstick value pack this week. This meal is from a while back, but the sales it’s based on roll around pretty regularly. My basic formula of meat/fruit/cooked veg/raw veg/starch is still how I tend to think about pulling a meal together, since 2/5ths of the family would very much prefer foods not touch. Clearly, not everyone has a garden, so the extra spent there would but you right about $10. 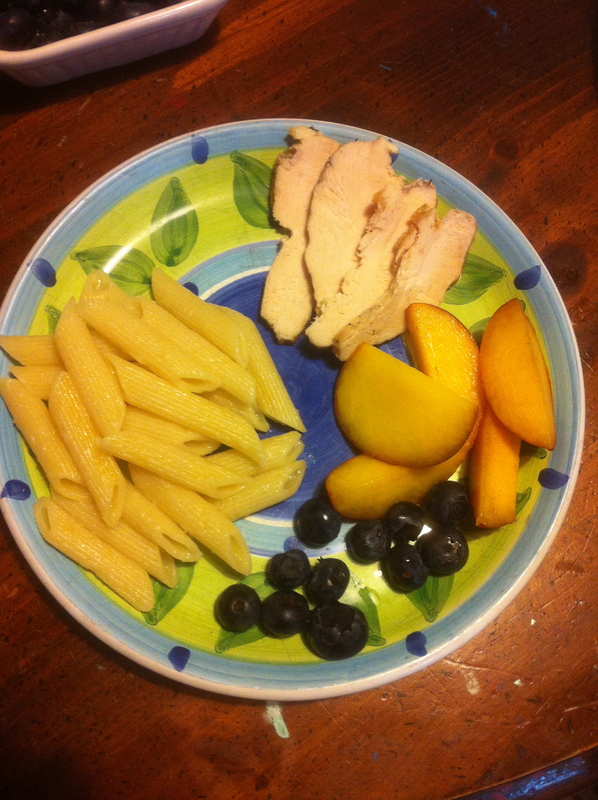 This meal had everyone happy with the pasta, chicken and fruit, the kids not excited about sliced tomatoes with salt or the steamed spinach, and me glad to have a healthy meal in about 30 minutes. Stay tuned for the next $10 dinner! Cheep cheep! Corn! 8/$1! I love 25c corn, and what’s even better is when it’s half that!! I’ll freeze some, and make corn pudding, and have ears of corn at both Saturday and Sunday supper. Yay corn! Organic grapes are $1.98/lb (Sprouts)–a great price for a Dirty Dozen item. 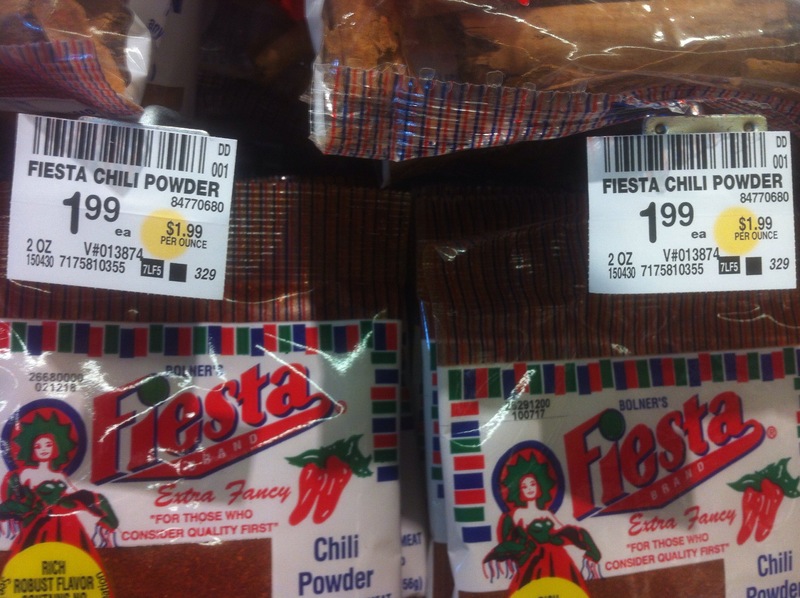 Conventional are 99c (Fiesta), though, so it’s a budget item for a lot of us. 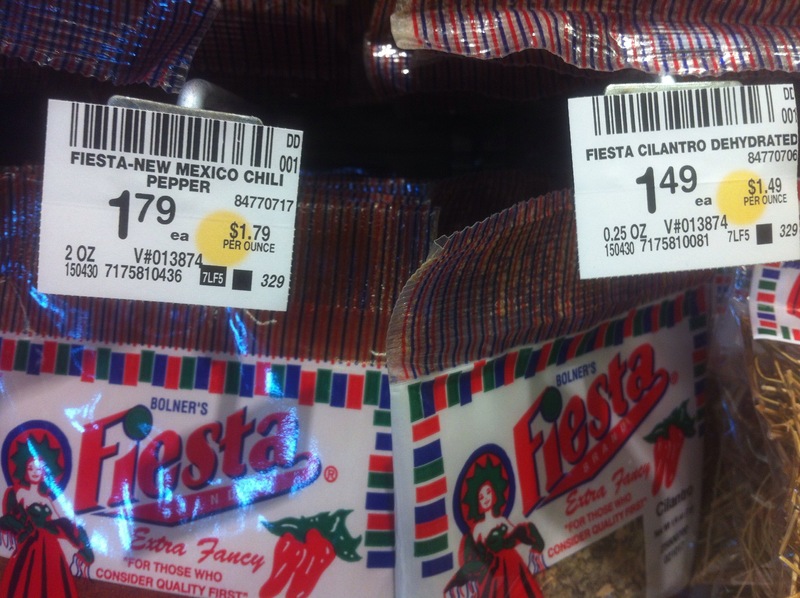 Fiesta’s got the bone-in ribeye that I love at $6.99/lb. Yes, a splurge they’re advertising for Father’s Day (Dads like steak! ), and there’s a Fiesta Limit in effect, so only two with a $10 purchase. 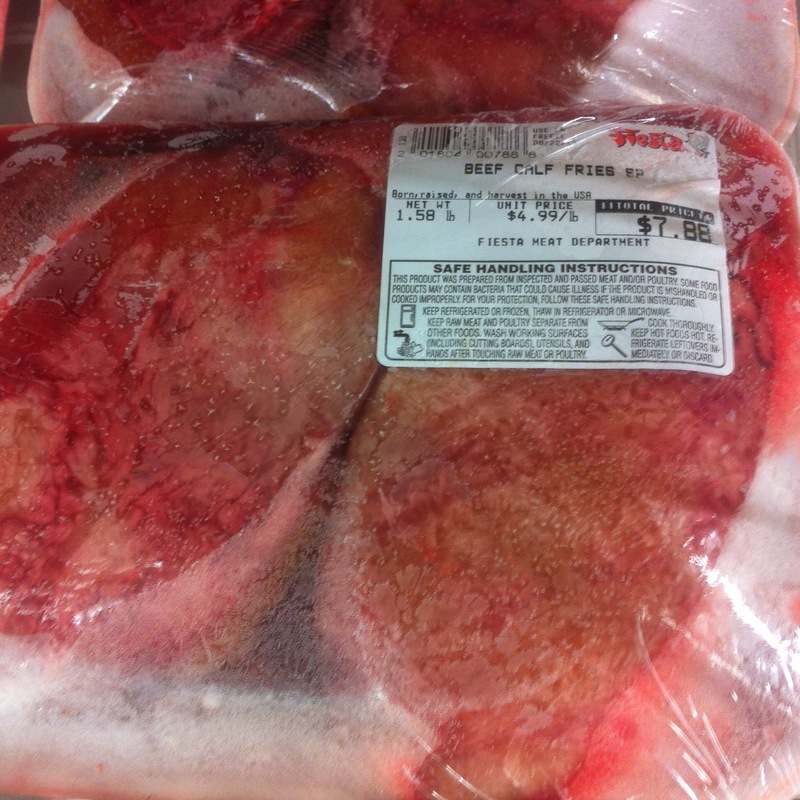 Given the normal price is $10.29/lb, I feel it’s worth mentioning here, even though it’s not cheep. Randalls has the big cheese pizza that feeds my three kids and one extra kid for $5 on Friday. Yes there is tons of better pizza out there, and if your kids deserve it you might buy it for them. At $5 this is the pizza my kids will be eating while we argue about what to rent on Amazon and how they might more effectively earn my love. Don’t Forget: Double Ad Wednesday at Sprouts–last week’s and this week’s specials in effect! 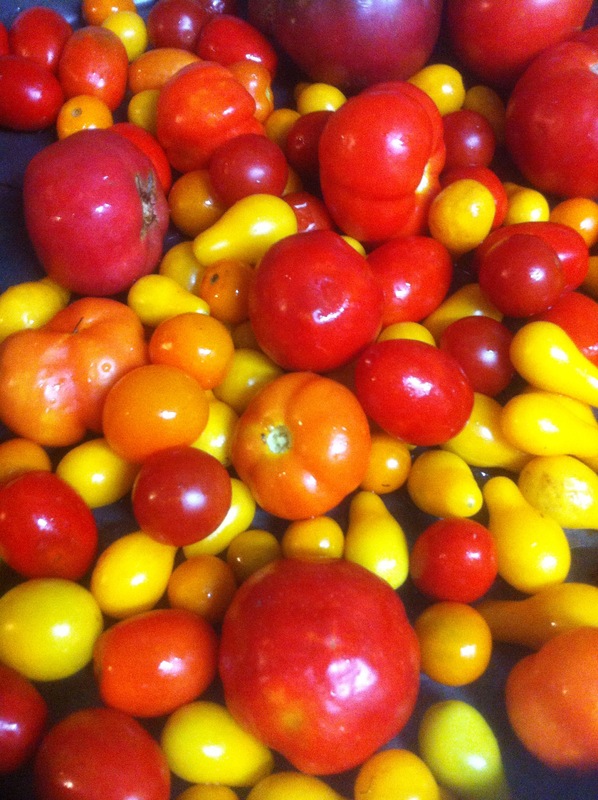 I’m giving in to the stink bugs and calling an end to tomato season. They have proven super-resilient and are giving me tomatoes that aren’t so great, so the plants will be sacrificed to make way for more pepper plants. This last haul is everything-plum, sun gold, early girl, and those cute bitty yellow pear shaped ones. I’ll be roasting them and packing away I the freezer for sauces later. Love it when I stock the freezer for cheep! This isn’t one of them though. For my mom, who is wondering what this is, exactly: it’s the part they remove to create a steer from a young bull. So, testicles. $4.99 a pound for bull testicles. Which I have tried, because they are served at fairs and I, like anyone, am succeptible to the grease-hazed air at a fair that lulls you into thinking anything that is fried is good and anything good is fried. It was not unlike a fried clam, but larger and chewier and with a much larger number of older gentlemen watching me with amusement. Chicken legs for Cheepie, no regrets! Cheep cheep! 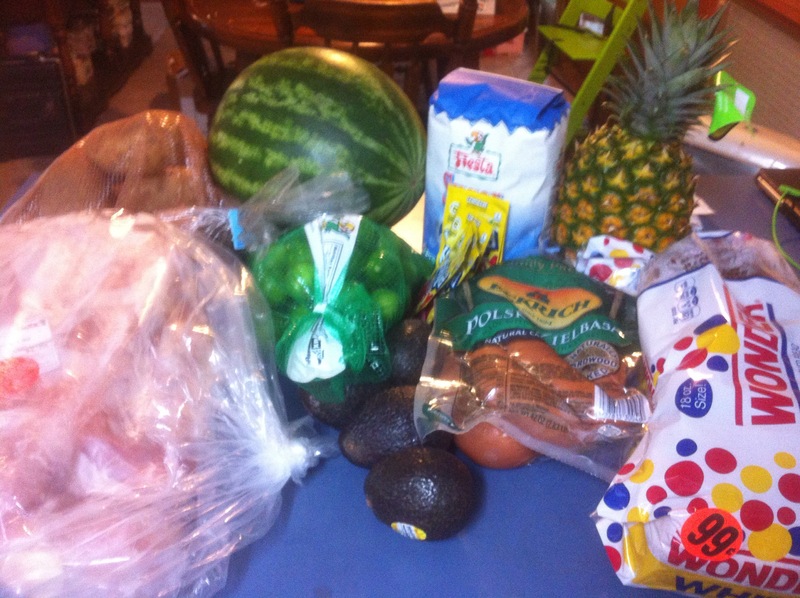 This is what $18.63 will get you at Fiesta today and tomorrow. That’s 5 lbs of potatoes back there, along with over 10lbs of chicken legs and 2.63 lbs of keilbasa. Not a bad hauls for less than $20. I know, you’re thinking, “Cheepie, what is with the Wonder Bread?” My answer is: I saw a clown on the way in and the rack of Wonder Bread on sale was right there, like a colorful childhood comfort. You would have bought it, too. I know math isn’t everyone’s thing. But if you’re a store, and you’ve got a box on the price tag for ‘unit price’, you should know what it means. At least make an effort at some type of calculation. Just putting the price of the item over there again makes it seem like you aren’t even trying. I know I’ve ranted on this topic before, but it’s a pervasive, persistent problem. I find examples of this every time I’m in a grocery store. Part of stretching a grocery budget is comparison shopping, and without unit prices (or with deceptive unit prices, or changes in ‘unit’ choices) that becomes more difficult. I have no problem pulling a calculator out to figure out what I need to know, but not everyone has my brand of commitment to knowing the answer to this particular problem. Maybe I should start writing the correct unit prices on tags? Guerrilla Grocery Correction–coming to a store near you!